This large tree is spread sparsely throughout Serengeti. It produces characteristic long (1 m), succulent, poisonous fruits that drop from the tree and release seeds as the pulp rots. The vine-like fruit stalks can be seen for months after the fruits are dropped. There is a dry bush joke that the worst place to camp is under a Sausage tree .. if the 5 kg fruits don't crush you, then the elephants will as they come to collect the fruits. 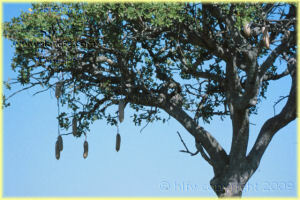 There is a widespread local belief that Sausage tree fruits, when hung in your hut, will ward-off whirlwinds. According to African legend, each animal was given a tree to plant by the Great Spirit. When the hyena was assigned the baobab tree, the careless animal planted it upside down--"and that is why its branches look like gnarled roots." With this intriguing bit of folklore, Bash proceeds to unfold the life cycle of this majestic bastion of the Tanzanian savannah. Frequently measuring 60 feet tall and 40 feet across, these giants -outlive nearly everything on earth-, their life span is over 1000 years. In this compelling and moving account, the baobab stands proud and stately as a vivid panoply of activity unfolds within its sprawling branches. With stirring landscapes and lavishly detailed close-ups, Bash's realistic watercolors bring this profusion to vibrant life. Finally, an old tree dies and -collapses in on itself, a melted heap of ruins.- A seed sprouts, a new baobab tree begins to grow and life continues. 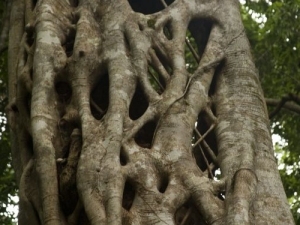 The Strangle Fig begins life as a small vine-like plant that climbs the nearest large tree and then thickens, produces a branching set of buttressing aerial roots, and strangles its host tree. An easy way to tell the difference between Strangle Figs and other common figs is that the bottom half of the Strangler is gnarled and twisted where it used to be attached to its host, the upper half smooth. 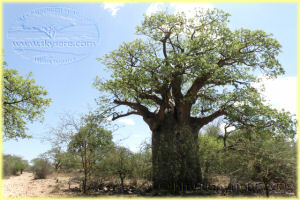 A common tree on kopjes and along rivers in Serengeti; two massive Fig trees near Serengeti; the "Tree Where Man was Born" in southern Loliondo, and the "Ancestor Tree" near Endulin, in Ngorongoro are significant for the local Maasai peoples. Palms are monocotyledons, the veins in their leaves are parallel and unbranched, and are thus relatives of grasses, lilies, bananas and orchids. 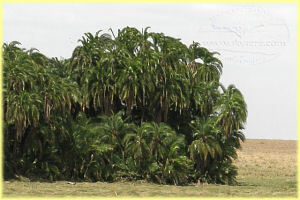 The wild Date Palm is the most common of the native palm trees, occurring along rivers and in swamps. The fruits are edible, though horrible tasting, while the thick, sugary sap is made into Palm wine. The tree offers a pleasant, softly rustling, fragrant-smelling shade; the sort of shade you will need to rest in if you try the wine. (Yes, the names are supposed to reversed like that) The Candelabra tree is a common tree in the western and Northern parts of Serengeti. 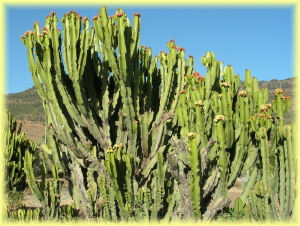 Like all Euphorbia the Candelabra breaks easily and is full of white, extremely toxic latex. One drop of this latex can blind or burn the skin. Traditional people plant the tree as cattle fencing, as predators will not attempt to push their way through the dense and poisonous stems. Some circles of Candelabra can be seen in the park, where seasonal dwellings existed before the establishment of the park. Commiphoras can easily be distinguished from Acacia tree species by the Commiphora's peeling, papery blue/yellow bark. 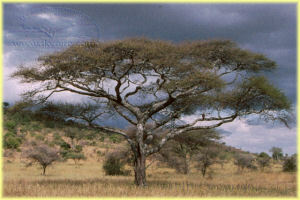 These trees occur throughout Serengeti, and are the dominant species in the eastern part of the park. Local medicine makes use of the bark, roots, and berries for a variety of treatments, including stomach complaints, liver problems, colic children, and rashes. 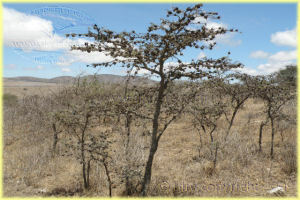 While there are several species of Commiphora in Serengeti, Commiphora africana is the most common. 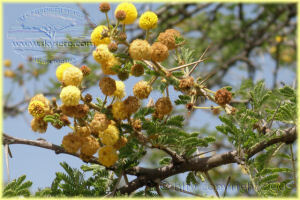 The Yellow Fever Tree is a common site in Lake Manyara in wet areas of black-cotton soil, such as along rivers. Early settlers in Kenya and India knew that malaria was more common near standing water, but blamed the Yellow Acacias there instead of mosquitoes; thus the name "Yellow Fever Tree". The tree that has come to represent Africa. Acacia tortilis arches dramatically over the savanna throughout Serengeti. 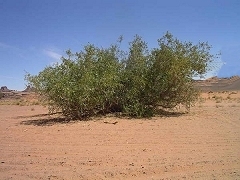 The seedlings of this tree are favored by elephants and cannot survive bush fires, so only twice in the past one hundred years have tortillas trees been able to grow. As such all of the tortilis trees in Serengeti are either 100 or 20 years old. Tap a "drip" and you are in for a surprise. This odd-looking tree has hard, hollow spheres at the base of its thorns, filled with biting ants. The tree actually encourages these ants by both providing homes and food in special flower-like structures called "extra-floral nectaries". These tree grow in abundance wherever the soil is saturated. 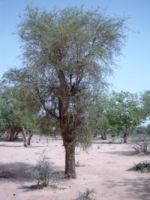 The Balanites tree is often confused with Acacia trees, but can easily be identified by its green thorns. This tree produces a date-like nut that is tasty both raw and roasted (with cinnamon). 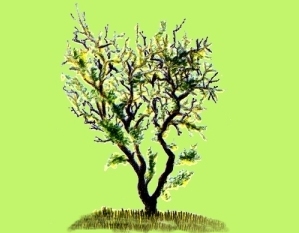 The green thorns are rumored to be photosynthetic, so the tree is both happy and alive even without its leaves. 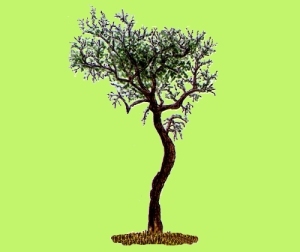 The toothbrush tree is a low bush with characteristic long, arching shoots. These shoots, when green, are cut by locals and used as toothbrushes. First, they chew on the end until it resembles a normal toothbrush, and then they brush their teeth with it, spitting out the fragments of wood all the while. It may sound unpleasant, but their smiles tell of a job well done.